The Gala Bingo is one of the most reliable and oldest Bingo sites in the UK with Low Wagering Requirements. The renowned bingo website is powered by everyone’s favourite Virtue Fusion. The licencing authority of Gala Bingo is Alderney Gambling Control Commission. According to Gala Bingo betting rules a player has to wager their bingo bonus twice (2x) before they can withdraw it. That means if you have a balance of £10, you will have to bet minimum £20 on Bingo (10X2 = 20). Gala Bingo takes the processing time of 3-5 working days for withdrawals which is pretty fast in comparison to other Bingo Sites. Payout Percentage has always been the best at Gala. Every month they pay millions to their users as cash and prizes both Online and Offline. New joiners get £30 welcome bonus plus over £10,000 to be won in Free Bingo Room for first seven days on deposit of £10 (ten) pounds. There is an excellent list of promotions at Gala Bingo. Customers can endure the vast shopping experience with Big Bankers Bingo, play 52 Lives Charity Games, enjoy Queen’s 90th Full House Party, join Team Bingo. 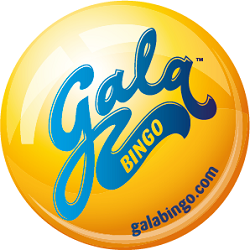 Live Caller Bingo is the major attraction on Gala Bingo’s online site. So if you are looking for a site that is ethical and has fair rules & regulations, then Gala Bingo is the right choice. Deposit Methods – Visa Debit, Maestro, Solo, MasterCard, PayPal, Neteller, Paysafe card, eco wallet, bank transfer and my citadel wallet. Support – 24/7 Live Help, Email Id – help@galabingo.com or Call at UK Freephone number: 0800 294 7294 (or +44 1483 716 540 from outside the UK). Read the Best Bingo Reviews about- mFortune Bingo, Mecca Bingo & Betfred Bingo!